Fostering Forward Michigan is starting a new recognition program that we hope will encourage families to gain the training which we believe will be most relevant to our families’ success. We are all looking for ways to enhance our parenting skills in the hopes of helping our children move towards healing and resiliency. After years of service to our community, our board members feel strongly that the best way to gain those skills is through training and education. We also know from working with hundreds of families new to our child welfare system that training can greatly improve the success rates for first time placements. In the Levels of Distinction recognition program, families can earn up to three levels of recognition based on the number and types of training hours they have attended. We hope this recognition program will be a way to encourage our peers to obtain critical training which we believe can directly benefit their families' quality of life. We also want this recognition program to be a way to recognize the dedication of those resource families who are willing to make a substantial investment in their families and communities by reaching the highest levels of training. 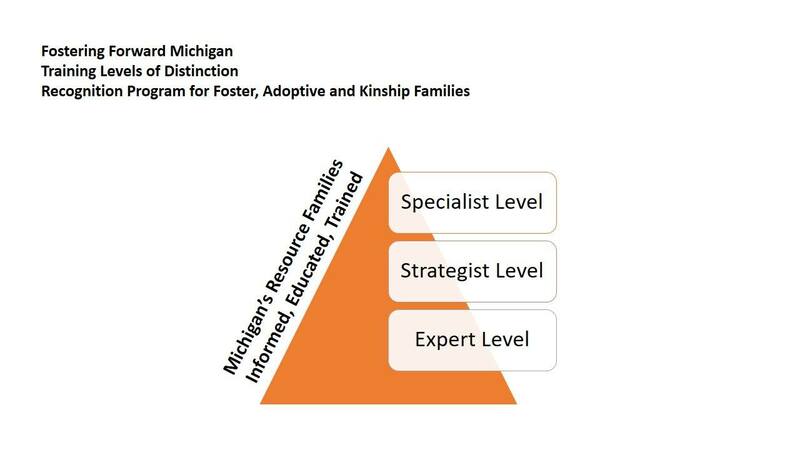 Families who want to apply for a level of distinction can email larab@fosteringforwardmi.org, fax 844-290-7080 or text 517-304-3823 proof of training to our offices for approval. Once your documentation has been received and approved you will receive notification and can be listed on our website as a family who has achieved training distinction. All families who have achieved a level will be entered into our bi-annual prize drawings. Recommended for all families, including families who are new to the child welfare system. 2 Hours of Elective Training that addresses specific parenting techniques or mental health issues/diagnosis common to children not living in their family of origin. Recommended for families who are parenting children with complex needs and children who have experienced multiple placements. 3 Hours of Electives that address specific parenting techniques or mental health issues/diagnosis common to children not living in their family of origin. Community leaders providing peer-to-peer support should be working toward an expert level designation.